The medium sized feline (70-90cm, tail 28-40cm) is yellowy-brown up to reddish and the black ring-pattern on the fur goes over to stripes in the head-area as well. Ocelots are nocturnal, rarely diurnal. 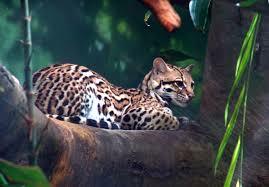 The ocelot is mostly hunting on the ground (lizards, rodents, snakes, birds and other small vertebrates). It is often found near river- shores. As it had been hunted because of the beautiful fur, the ocelot has become quite rare.